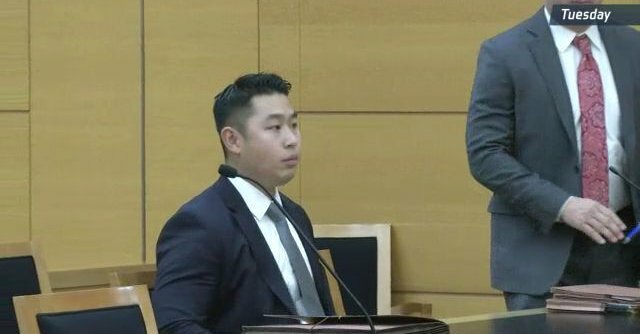 After nearly three days of deliberation, jurors found former NYPD rookie police officer Peter Liang guilty of manslaughter and official misconduct in the shooting death of Akai Gurley in late November 2014. Liang, whose position with the NYPD was automatically terminated with his guilty verdict, reportedly dropped his head as the guilty verdict was read. Sentencing is scheduled for April 14th, and Liang faces up to 15 years in prison. 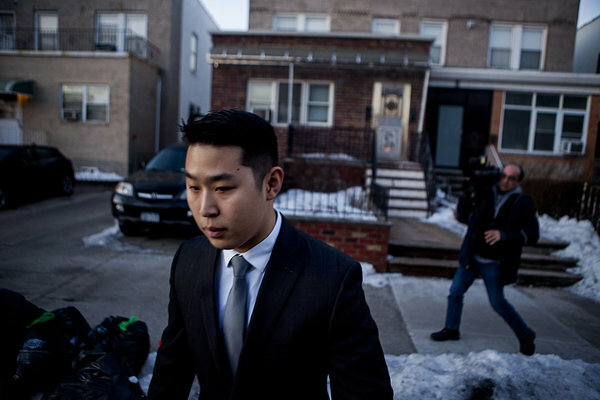 For the last several days, jurors had deliberated Liang’s fate after hearing details about how Liang fired a single round from his service weapon while he and his partner, NYPD police officer Shaun Landau, were conducting a vertical patrol in the heavily-trafficked stairwell of a residential apartment building. Prosecutors argued that Liang acted recklessly when he fired into the darkness of the unlit stairwell despite ample police academy training that instructed him and all officers to not place their fingers in the trigger well of their weapon unless they are ready to fire a shot; jurors also heard that Liang’s weapon required 11.5 pounds of force in order to pull the trigger, a modification specific to police service weapons ensuring that they need nearly twice the force required to fire compared to commercially-available handguns to minimize accidental discharges. Arguments came to a close today in the trial against NYPD officer Peter Liang, charged with manslaughter and two counts of official misconduct in the shooting death of Akai Gurley, who was unarmed and visiting a friend at the time he was killed. Two weeks of evidence came to a close when Liang took the stand to tearfully testify that he pulled the 11.5-pound trigger of his service weapon and a fired a shot into the darkened stairwell of a residential building when he was “startled” by an unknown, and that he failed to give CPR when confronted by a dying Gurley in the stairwell of the Louis H. Pink Houses because he didn’t feel like he had sufficient training to perform the life-saving measures and that Gurley’s friend — who had never learned CPR — would be better for the task. As for why he never called for help, Liang’s defense claims that his call for an ambulance was never recorded in official transcripts of the incident because reception in the stairwell was “spotty”. The manslaughter trial against Peter Liang — the police officer accused of manslaughter in the fatal shooting of Akai Gurley, an unarmed Black man killed when Liang opened fire with his service weapon in a darkened stairwell — began yesterday with opening statements by both the prosecution and the defense, and the calling of two witnesses. Liang’s case has been viewed as one of several examples of state violence against Black bodies in recent years, and several activists (including myself) have rallied in support of the Gurley family in calling for Liang and all other police involved in suspicious shootings against unarmed Black citizens to face criminal accountability. Late last year, news media reported that Liang had elected to face a jury trial in the case against him, and in the last week, jury selection resulted in a juror pool consisting of only one African American jury member and no Asian Americans. 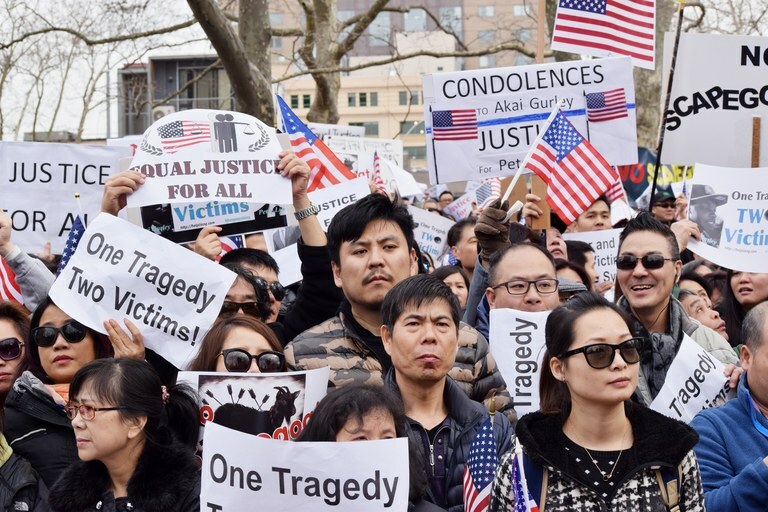 Although many Asian Americans — including signatories of this open letter organized by CAAAV — have sided with Black Lives Matter activists in seeking #JusticeForAkaiGurley, Liang’s case has also attracted a surprising reaction from some within our community. Some Chinese Americans have come out in defense of Liang’s actions, arguing that Liang’s trial is evidence of systemic racial bias and demanding that the charges against him be dropped. Liang’s supporters seemed largely unswayed by the details that have emerged about the fateful moment in the stairwell of Louis H. Pink Houses in late 2014 that left Akai Gurley dead by the police officer’s hand.